If you are wearing your seat belt properly adjusted and you are sitting upright and well back in your seat with both feet on the floor, your chances of being injured or killed in a collision and/or the severity of injury may be greatly reduced. NISSAN strongly encourages you and all of your passengers to buckle up every time you drive, even if your seating position includes a supplemental air bag. Most Canadian provinces or territories specify that seat belts be worn at all times when a vehicle is being driven. Every person who drives or rides in this vehicle should use a seat belt at all times. Children should be in the rear seats and in an appropriate restraint. be properly adjusted to a snug fit. Failure to do so may reduce the effectiveness of the entire restraint system and increase the chance or severity of injury in an accident. Serious injury or death can occur if the seat belt is not worn properly. Always route the shoulder belt over your shoulder and across your chest. Never put the belt behind your back, under your arm or across your neck. The belt should be away from your face and neck, but not falling off your shoulder. Position the lap belt as low and snug as possible AROUND THE HIPS, NOT THE WAIST. A lap belt worn too high could increase the risk of internal injuries in an accident. Be sure the seat belt tongue is securely fastened to the proper buckle. Do not wear the seat belt inside out or twisted. Doing so may reduce its effectiveness. Do not allow more than one person to use the same seat belt. Never carry more people in the vehicle than there are seat belts. If the seat belt warning light glows continuously while the ignition is turned ON with all doors closed and all seat belts fastened, it may indicate a malfunction in the system. Have the system checked by a NISSAN dealer. No changes should be made to the seat belt system. For example, do not modify the seat belt, add material, or install devices that may change the seat belt routing or tension. Doing so may affect the operation of the seat belt system. Modifying or tampering with the seat belt system may result in serious personal injury. Once seat belt pretensioner(s) have activated, they cannot be reused and must be replaced together with the retractor. Removal and installation of pretensioner system components should be done by a NISSAN dealer. All seat belt assemblies, including retractors and attaching hardware, should be inspected after any collision by a NISSAN dealer. NISSAN recommends that all seat belt assemblies in use during a collision be replaced unless the collision was minor and the belts show no damage and continue to operate properly. Seat belt assemblies not in use during a collision should also be inspected and replaced if either damage or improper operation is noted. 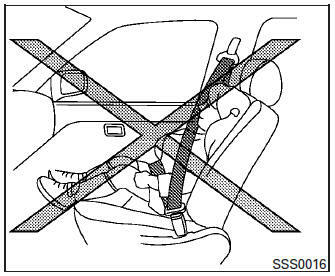 All child restraints and attaching hardware should be inspected after any collision. Always follow the restraint manufacturer’s inspection instructions and replacement recommendations. The child restraints should be replaced if they are damaged.